Reset List presents an improvised Rock and Roll extravaganza with songs so new they haven’t been written yet. This Chicago Reader Recommended group has combined the Chicago music and improv comedy scenes and integrated them into one show, a completely improvised rock concert. Every part of the evening is improvised from the chord progressions, to the lyrics, harmonies, dance breaks, and everything that goes on in between. Through the course of the show the band requests song titles from the audience to fill up the evening’s set list. Anything goes. Previous songs have included titles such as “Illiterate Tadpoles”, “Unicorns vs. Puppies”, “Rhinestones on the Back of My Belt”, and “This is Why We Don’t Do It in the Road.” The band fleshes out each of these songs for the audience in full. No song is ever sung twice. Every night is a brand new show with a completely new set list. Reset List was delivered into this world under blizzard conditions in early 2009 by Matthew Gottlieb, Missy Moreno and Israel Pederson. The three met at the Second City Musical Improv Conservatory where they engaged in a three-way talent crush. After Reset List’s initial birth and loss of vestigial tail (aka Aaron Rice, may he rest in LA) they added Andrew Graves to the mix. And as bands are wont to do, Reset List’s roster has…well…reset itself over the years since it’s incarnation. The band is currently helmed by Matthew Gottlieb and Missy Moreno who run things from both the east coast and the third coast. Reset List has been featured around Chicago at Davenports, Martyr’s, two five-week runs at the Viaduct Theater, a Chicago Reader Recommended six-week run at Donny’s Skybox in the Second City, the penthouse of Hotel 71, the Chemically Imbalanced Comedy Theater, Cabaret Vagabond’s Christmas of the Future, the closing night festivities for the Chicago Improv Festival and at the New York Musical Improv Festival at the Magnet Theater in NYC. 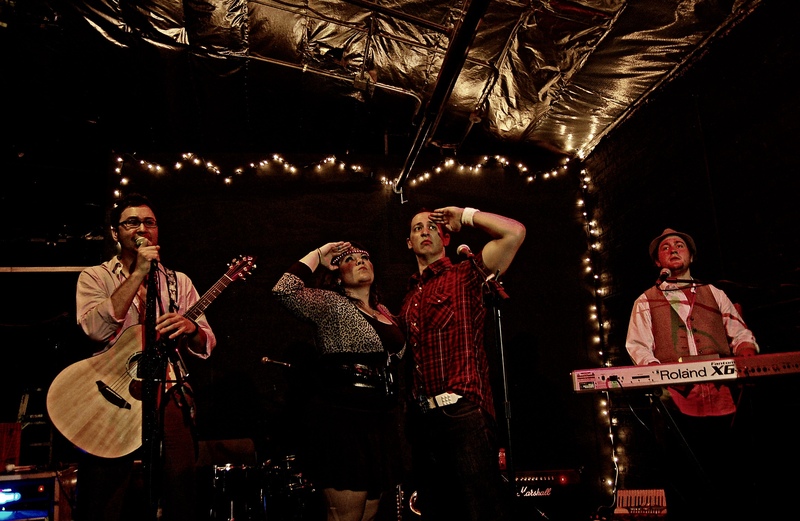 Recently, Reset List ventured to Pittsburgh to play at the Sing Sing Dueling Piano Bar. Matthew Gottlieb (guitar, mandotar, loops, vocals) graduated from the University of Maryland College Park in 2004 with a BA in Theatre Performance and began his Chicago theatre and improv career in 2005. Recent selected theatre credits include The Room: The Musical (pH Productions), The Breakfast Club Musical (pH Productions), Touch (New Leaf Theatre), Lyle, Lyle, Crocodile (Lifeline Theatre), The Beastly Bombing (Trapdoor Theatre), Dorian (Bailiwick Repertory), Zombies From the Beyond (Backstage Theatre), and Seussical (Emerald City Theatre). Matt is a graduate from the Musical Improv Conservatory at the Second City as well as the improv programs at iO and the Annoyance Theatre. He has performed with Emperor and The Rabble at iO, The Second City Musical Improv House Ensemble, Infinite Sundaes and Forte: Improvised Musical Theatre at Donny’s Skybox and is currently performing with pH Productions at Studio BE. Missy Moreno (auxiliary percussion, melodica, vocals) hails from Pittsburgh PA where she graduated from Point Park University’s Conservatory of Performing Arts. While there, Missy worked with the REP Company, Pittsburgh Musical Theatre Company and won first place in the NSAL Acting for Comedy Competition representing Pittsburgh in the Nationals in Hawaii. Since moving to Chicago, she has trained with Second City’s Improv Conservatory and Musical Improv Conservatory and is a an ensemble member of their Music Improv House Ensemble, Infinite Sundaes. Missy has been a Cabaret Artist with Davenport’s Cabaret Room in Wicker Park and just finished filming a new pilot with Frequency Television through Columbia College.